Valve has teased a new VR spectator mode for its uber-popular MOBA DOTA 2 and could end up being one of the most exciting VR experiences yet. 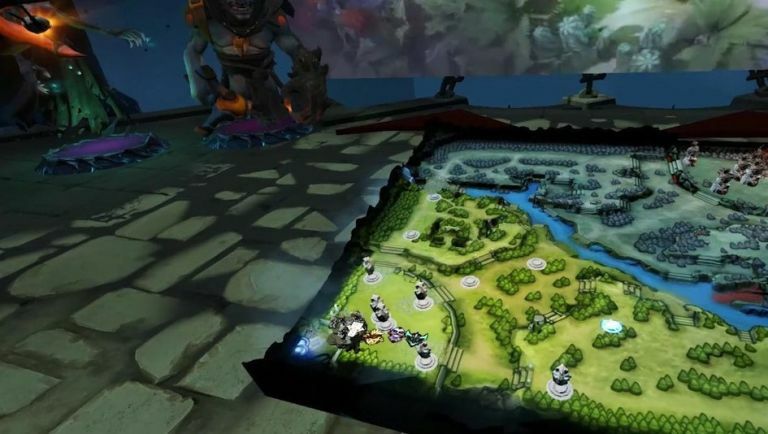 Nothing has been confirmed yet, but a recent video shows a user viewing a round of DOTA 2 on a war table in a virtual chamber styled like the game. The teasing footage shows the user exploring the game world in VR, using HTC Vive controllers to bring up stats and details on each player's chosen in-game avatar. The use of the Vive makes perfect sense considering the partnership between Valve and HTC, but it's not clear whether the experience would make it onto any other SteamVR machies. Considering how big eSports is getting, with DOTA 2 right up there with League of Legends and Counter-Strike GO as the games leading the charge into the mainstream, a wider rollout certainly isn't beyond the realm of possibility. As avid fans of VR and eSports, we're really excited for the potential for this combination both in games such as DOTA 2 and in the wider world of spectator gaming. Sadly, there's no news on when this tech will be arriving (if at all), so watch this space for more info.